New analysis published online Monday in the Proceedings of the National Academy of Sciences has determined that the artists of the paintings of horses in France’s famous caves were creating realistic depictions of horses they saw rather than dreaming them up. 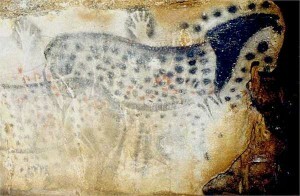 With past research of ancient DNA only turning up evidence of brown and black horses as seen painted in the Lascaux Cave and Chauvet Cave, scientists wondered if the spotted horses seen in other caves such as Pech Merle, with it paintings of white horses with black spots, were real or fantasy. To answer the question, an international team, headed by Germany’s Leibniz Institute for Zoo and Wildlife Research, analyzed DNA from 31 prehistoric horses from samples of fossilized bone and teeth that were found at a number of archaeological sites at locations ranging from Siberia and Eastern and Western Europe to the Iberian peninsula. As a results of the research it was discovered that six of the 31 horses analysed had a genetic mutation that causes spots, suggesting that prehistoric artists were actually drawing what they were seeing and not using their imagination.